This privacy statement describes how Big Tow collects and uses the personal information you provide. It also describes the choices available to you regarding our use of your personal information and how you can access and update this information. You may opt-out of receiving our newsletter or marketing emails from us by following the unsubscribe instructions included in each newsletter or marketing email or you can contact us. if Towmaster is involved in a merger, acquisition, or sale of all or a portion of its assets, you will be notified via email and/or a prominent notice on our Web site of any change in ownership or uses of your personal information, as well as any choices you may have regarding your personal information. This site is owned and operated by Big Tow unless otherwise specified. All materials appearing on this site, including the text, site design, logos, graphics, icons, and images, as well as the selection, assembly and arrangement thereof, are the sole property of Big Tow. Copyright ©1994-present, ALL RIGHTS RESERVED. All audio and video clips are the sole property of Big Tow or their respective content providers. No materials from this site may be used without Big Tow’s prior permission. All rights not expressly granted herein are reserved. Big Tow names and logos are registered trademarks, trademarks or service marks of Big Tow. All other trademarks or service marks are property of their respective owners. 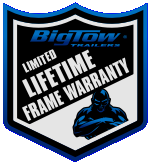 All of Big Tow’s products are warranted against defects for the period specified on their respective warranties from the date of the original manufacturer’s invoice. Except as expressly stated herein, Big tow makes no representations or warranties, either expressed or implied, of any kind with respect to products sold. See our warranty section for warranty specifics. In the event a product is listed with incorrect information due to typographical error or error in pricing or product information received from our suppliers, Big Tow shall have the right to refuse or cancel any orders placed for that product. This site may contain links to other sites on the Internet that are owned and operated by third parties. You acknowledge that Towmaster, Inc. is not responsible for the operation of or content located on or through any such site.